Don’t Miss The Treasure Hunt! Can you believe conference is almost here?? And Seekerville will be experiencing a first — all 15 of us will be in the same physical room at the same time!!! WooHoo! We’ve congregated in virtual reality for 4 years and finally all of us are clustering in Denver. Hosted this year in gorgeous Denver, Colorado September 17 – 20, the 2009 American Christian Fiction Writers (ACFW) conference promises to be packed full of advice, workshops and of course, writers!! Don’t miss keynote speaker Debbie Macomber as she highlights her writing, offers advice and encourages in the special way that’s all Debbie. A special treat offered as an Early Bird session, special guest Donald Maass promises to educate on a level worthy of Breakout Novels. And don’t forget, if you miss any workshop (except Donald Maass), CDs and MP3 are available at a very modest cost. 1. 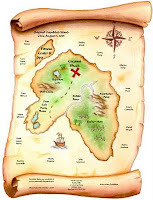 If you are attending the ACFW conference in Denver you simply print out a Treasure Map and start. Each of the 15 Seekers who will be at the Marriott DTC will have stickers. When you find a Seeker, get a sticker and cover their name. When you have all 15 squares covered or it’s time to leave Denver simply mail the map to Seekerville C/O Camy Tang, P.O Box 23143, San Jose, California 95153-3143. A limited number of maps will be available with Seekers, if you forgot to print yours. Maps must have at least one sticker on them to be eligible. A. You must be a Seekerville Follower. B. Email a list of Seekerville books you read in 2009 to tina at tinarusso dot com (be sure to put Seekerville Treasure Hunt) in the subject line. Giveaway starts Wednesday September 16 at 1 am PST and ends at 12 midnight PST, Thursday, October 1st. 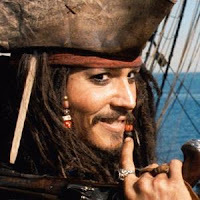 Winners will be announced in the Sunday, October 4, Weekend Edition by Captain Jack Sparrow. All maps and non conference entries (except the grand prize winner) will be entered into a drawing for one of 10 sets of Seekerbooks. That’s ten sets of two books each. Book title prizes are randomly picked. All maps and non conference entries (except the grand prize winner and the book set winners) will be entered into a drawing for one of four copies of the Donald Maass new release, The Fire In Fiction. 1. No purchase necessary to enter the any Seekerville Treasure Hunt. The giveaway will end on the date stated in the posting. The opportunity to play may be affected by local ability to access the Internet at any particular time. 2. Open to all readers, 18 years or older who are legally allowed to participate in such a give away as allowed by their local laws. 3. Players must submit the required materials for each giveaway which will allow the entrant for a chance to win. Entrants will be informed if they are a winner on or after the Treasure Hunt end date. Limit one entry per person. Seekerville authors are not responsible for: incomplete, lost, late, damaged, scrambled or misdirected entries or other errors of any kind whether human, mechanical or electronic, which may limit a user’s ability to participate in the giveaway. 4. Seekers and their families are not allowed to enter the giveaway. Void where prohibited by law. All Federal, state and local laws and regulations apply. 5. Prizes will be assigned to those who have been identified as winners. 6. Entrants will be informed at the close of the give away if they are a winner, and if a player is identified as a winner, what prize has been won. Winners will receive their prizes via mail after the give away has completed and winners have been verified. Taxes, if any, are the sole responsibility of the winner. Seekerville assumes no responsibility or liability for any damages, losses, or injury resulting from the acceptance or use of any prize. All prizes are mailed out within 6-8 weeks of announcement of winner. 7. Entering the give away is considered a confirmation of eligibility on behalf of the enterer in accord with these rules and any pertaining local/federal/international laws. 8. Seekerville Treasure Hunt is not in any way affiliated with ACFW or its conference. Along with the fun of the hunt, Tina Radcliffe and I are playing tour guides for all followers of Seekerville and their friends. Denver will never know what hit her! For a hint of all the activities planned, mozy on over to the Seekerville Weekend Edition. Come join us for laughs and games as we soak up the wisdom and advice offered by some of the biggest and best names in the Christian publishing world. This entry was posted in ACFW, Conference, Seekerville, Treasure Hunt. Bookmark the permalink.